Thanks for your input on case one. What abnormality can you see on this film? Please respond via Twitter and include #teamhaem in your response. No answer is stupid and evryone’s thoughts are welcome. In particular I hope some medical students and medical/anaesthetic juniors might want to start us off with their thoughts on this film. 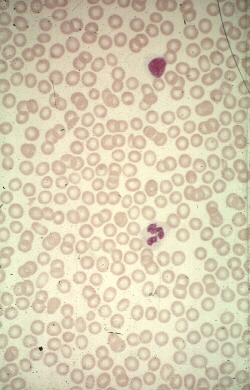 This entry was posted in Laboratory morphology and tagged Blood film. Bookmark the permalink.